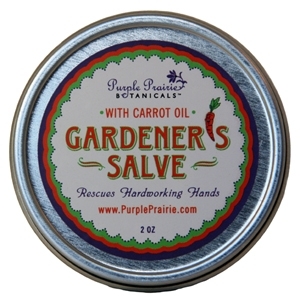 Made with calendula and chamomile which protect extremities before and after gardening. Weathered, cracked hands (and feet) will feel the instant relief. This special blend includes the heavenly scented oils of rosewood, mint and extra virgin coconut oil. 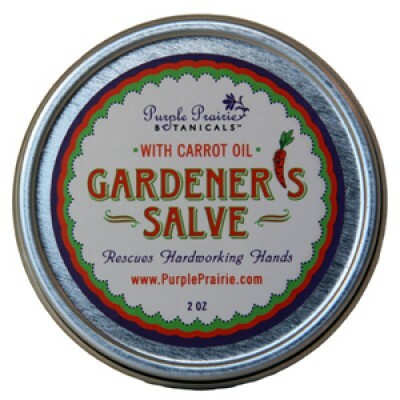 The precious carrot oil provides an extra dose of antioxidants to rescue hardworking hands (and feet). 2 oz. tin. EWG Rating is a 1. "Not sure? Try a sample!" Directions: Use before and after gardening, yard work and household chores. Try it as a first aid treatment. Feel the relief. 100% Natural Ingredients: Organic olea europaea (olive) fruit oil, organic helianthus annuus (sunflower) oil, cera alba (beeswax), unrefined organic cocos nucifera (coconut) oil, organic butyrospermum parkii (shea butter), calendula officinalis (calendula) extract, bois de rose (rosewood) oil, chamomilla recutita (chamomile) extract, mentha spicata (spearmint) oil, pelargonium graveolens (geranium) oil, melaleuca alternifolia (tea tree) oil, dausus carota (carrot seed) oil. Deep down clean! This bar's probiotic and exfoliating properties gently remove dirt while soothin..